After 64 years in business, the family-run firm has a well-deserved reputation for quality products and excellent service, and its membership of The Company of Master Jewellers (the largest independent jewellery buying group in the UK) allows access to a wide range of product lines. The Virtue range of silver stackable rings allows you to create your own combination, with designs from plain bands to coloured stones and motifs like flowers and butterflies. There are 80 rings in stock at Cupitts, starting at just £17, so you can have a play and select your favourites! On a similar theme, the Nomination collection enables you to create a unique bracelet – start with the stainless steel base and add the 18-carat gold links to build up your own design. Also new at Cupitts are Rist watches, which are very much in fashion at the moment; the funky, chunky silicone watches are available in a spectrum of vibrant colours. The latest collections from some of Cupitts’ most popular ranges are now in stock, including eye-catching rainbow-coloured designs by Coeur de Lion and beautiful sparkling pieces from the two prestige diamond brands, MasterCut and Hearts on Fire. 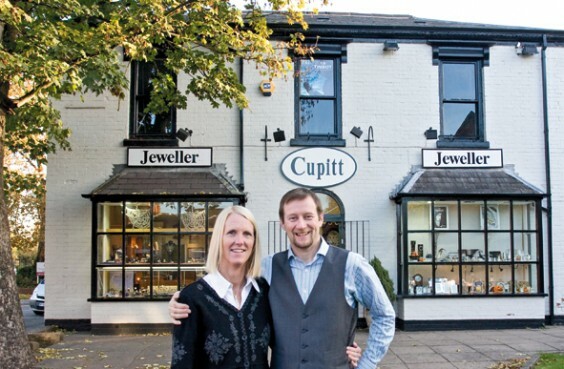 Cupitts is one of the biggest stockists of Lovelinks, the highly desirable build-your-own jewellery range featuring glass and silver charm beads, while the Ti Sento and Kit Heath collections continue to be popular. Don’t forget to check out the gentlemen’s jewellery by Unique, plus the beautiful ladies’ collection made from millefeuille Murano glass and silver. As always, the mix of traditional and modern jewellery and giftware, ensuring there’s always something to suit a wide range of tastes, ages and budgets. Alternative gift ideas include clocks, jewellery boxes and glassware, and of course Cupitts offers a full gift wrapping service to make your presents look truly professional. In keeping with its traditional ethos of personal service and expertise, Cupitts has a workshop on the premises where repairs and alterations are carried out and commissioned items are created. Feel free to call in and pick up a catalogue showcasing the latest collections in the run up to the Christmas season.